The Metro Centre at Owings Mills project is being developed as a mixed-use development on a 33-acre site in Owings Mills, Baltimore County, Maryland. 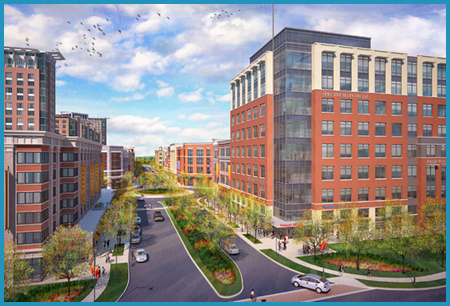 Situated adjacent to the Maryland Transit Administration (MTA) Owings Mills Metro Subway station, the project site boasts excellent access to downtown Baltimore and Interstate-795. As planned, the development includes 1,680 residential units and approximately 1,018,000 square feet of mixed-use commercial space, consisting of office, restaurants, retail, a health club, and hotels. In addition, the site features the Baltimore County Public Library Owings Mill Branch and the Community College of Baltimore County Owings Mills Extension Center. 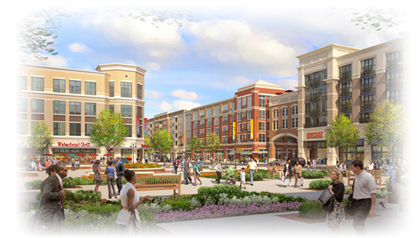 Upon completion, it is estimated that Metro Centre at Owings Mills project will be valued at approximately $506 million. In 2014, the Maryland Economic Development Corporation (MEDCO), a conduit issuer for Baltimore County, issued Special Obligation Bonds in the amount of $33,050,000. Bonds were issued to finance the cost to construct a 2,089-space public parking garage for the riders at the MTA Owings Mills Metro Subway station. Security for the bonds includes tax increment revenues and backup special tax revenues. An additional special tax was levied specifically for the purpose of funding the costs to operate and maintain the parking garage financed by the bonds. Other sources of financing for the project include a combination of debt, equity, and public grants. Bonds were issued to the developer and are to be drawn on as the public parking garage is constructed. Once a portion of the proposed development is constructed and generating sufficient tax increment revenue to secure debt service, the developer-held bonds will be converted and sold, with the interest rate determined by the capital markets at that time. Tax increment financing functioned as a land use development tool, facilitating the development a mixed-use development at the existing MTA Owings Mills Metro Subway station. It also acted as a source of financing for the cost to construct, as well as operate and maintain, a public parking garage for the riders MTA Metro Subway, spurring both high-density and smart growth at a trans-oriented development site. Prior to the issuance of bonds, MuniCap, Inc. served as the financial consultant to the developer, preparing the TIF plan of finance and feasibility analysis. Once bonds were issued, MuniCap, Inc. transitioned into the role of administrator to the Metro Centre at Owings Mills Development and Special Taxing Districts. As administrator, MuniCap, Inc. ensures compliance with best practices as determined by the Municipal Securities Rulemaking Board and Internal Revenue Service by preparing the required reports and documents.